Compare Yogurt Makers: Euro Cuisine, Aroma or Yogourmet? - First, just check the ingredients listed on the box of any commercially available yogurt. You will see a long list of items that may include ingredients such as milk, milk protein concentrate, whey protein concentrate, agar, pectin, modified corn starch, gelatin, natural and artificial flavors, citric acid, sodium citrate, active bacterial cultures, etc. Just incredible! Especially when you think that making your own yogurt requires only a few ingredients, such as milk, a source of bacterial culture, and if desired, some sweeteners to taste. You can also add powdered milk to thicken. In short, at most four ingredients are needed! Therefore, a real benefit of making your own yogurt is that you would be in complete control of the ingredients, fat content, and sweetness. Also, many of the commercial yogurts that claim to contain live cultures beneficial to your health, actually don't. - Second, when you make your own yogurt, it is up to you to decide what type of milk to use. You could use cow's milk, sheep's milk, goat's milk, or if for some reason you prefer not to use dairy products, you could use soy milk. - Third, it is estimated that, if you use a lot of yogurt in your diet, making it at home would cost you half the amount of money you would have to pay to buy it at the supermarket. - Fourth, with the no-guesswork yogurt makers available today, preparing regularly your own yogurt has become extremely simple with excellent results. - Finally, making your own yogurt, you would be helping our environment by eliminating packaging related waste, as you would be using your own jars and containers. At the end of this review, you will find an appendix on yogurt making basics. Container Sizes: Some yogurt maker come with one or two quart containers which are good if you want make large quantities. Other models come with a number of small jars (usually about 6 or 8) made of glass or BPA-free plastic that are convenient for making smaller portions to be used on different days of the week. While the larger containers are easier to clean, the small jars allow you to better plan the consumption of your yogurt and they are specially convenient for snacks or lunchboxes. Another advantage of the small jars is to allow for different flavors to be made simultaneously, so that everyone in the family can have his or her favorite! Auto-Shutoff Feature: The auto-shutoff feature is important as it stops the "cooking" process when the yogurt is ready, and you are not around to stop the unit. Note that, yogurt should be refrigerated as soon as it is ready so that it does not get acidic. Built-in Timer: Yogurt takes several hours to make. This may varies from 5 to 12 hours depending the type of the bacterial culture (i.e. the starter) and the size of containers used. Even though many models are equipped with automatic shut-off when the yogurt is done, some people may like to manually adjust the "cooking" time so that different consistencies and textures are obtained. A built-in timer makes this possible and is available on many models. Built-in Thermometer-Stirrer: The ideal temperature for making yogurt is above 100°F (37.7°C) and ideally around 110°F (43°C). If the temperature drops below 100°F results will not be satisfactory. A built-in thermometer will make sure that the required temperature is kept throughout the "cooking" process. In some models, these thermometers are also used as stirrers which is a convenient feature to have. Note that this feature is transparent in most models with no explicit thermometer as the unit internally keeps the yogurt at the required temperature. There are all kinds of yogurt making products on the market, but as long as you are provided with the features described above, there is no need to pay over a hundred dollars to get an expensive unit to make yogurt at home. The products reviewed below are all reasonably priced and provide you with all the features you need. They are the Euro Cuisine YM100, the Aroma AYM-606, and the Yogourmet. The first two have been selected here because they provide all the required features for worry free and no guesswork yogurt making listed above. The last one, though it is not fully automatic, was also selected because it is one of the largest yogurt maker on the market, and may be suitable for people who need to make larger quantities of yogurt. The Euro Cuisine YM100 yogurt maker comes with a user-friendly control panel with non-digital display, and an automatic shut-off function timer that would turn off the unit automatically at the end of the "cooking" cycle. No explicit thermometer is required as the unit internally keeps the yogurt at the required temperature. It comes with seven 6oz glass jars equipped with leak-resistant lids and can make up to 42-oz of yogurt . To clean, the yogurt maker should not be immersed in water, simply washed by hand with a mild detergent and a damp cloth, but the cups are dishwasher safe. The unit dimensions are 9.5 x 9.5 x 6 inches, and it has a three-year manufacturer's warranty. To buy this yogurt maker, please click the Amazon link image. The Aroma YM-606 yogurt maker comes with a user-friendly control panel with digital display, a built-in programmable timer, and the automatic shut-off feature. No explicit thermometer is required as the unit internally keep the yogurt at the required temperature. It comes with 8 BPA-free plastic reusable cups equipped with leak-resistant lids. It can make over 5 cups of yogurt. To clean, the yogurt maker should not be immersed in water, simply washed by hand with a mild detergent and a damp cloth, but the cups are dishwasher safe. The unit dimensions are 9.4 x 9.4 x 11.4 inches, and it comes with a one-year limited warranty. 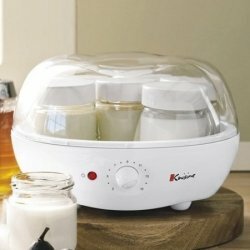 The Yogourmet yogurt maker is not as automated as the ones described above, and it does not have any built-in timer or an automatic shut-off feature. Therefore, it does not remove any of the guesswork, and it takes a few tries before you develop the expertise required to make satisfactory grade yogurt. The reason we have included it into our selected products list here is because it is the largest capacity yogurt maker available on the market. It can make up to 2 quarts of homemade yogurt. It comes with an outer container and an inner jar, both with lids, a digital thermometer, a cheesecloth bag for making yogurt-cheese, and an instruction manual. The jar is made of plastic instead of glass. However, it has a very tight no-leakage seal. The unit uses a "water bath" system to create an even heating wall around the inner jar to maintain the temperature required to allow the yogurt to set properly. It can also be used to make fresh cheese, sour cream and buttermilk. The unit's dimensions are 7.8 x 7.8 x 10 inches, and it comes with a one-year warranty. So which of these yogurt makers to buy? If you prefer using glass jars rather than plastic, you should choose the Euro Cuisine YM100. One other advantage of Euro Cuisine YM100 is that you could also use a larger lidded container which can be placed into the unit, instead of the little jars. This way, you could make larger quantities of yogurt rather than having always to make yogurt in small jars. Given the above two reasons, we prefer the Euro Cuisine YM100 automatic yogurt maker, but you will certainly not be unhappy with an Aroma AYM-606. Finally, you should choose the Yogourmet if you need to make larger quantities of yogurt and you don't mind a unit that is not fully automated. You will find below the yogurt makers discussed in this review. Some of these products are sold at great discounts with respect to their List Price. Please click your selected yogurt maker below to check the price or to purchase. Step 5: Refrigerate the obtained yogurt. If you do not refrigerate, the yogurt will turn acidic. These seem like simple steps, but if the temperature related requirements are not properly executed you would not obtain good results. When you compare yogurt makers, you find out that these requirements are best achieved using an electric yogurt maker. 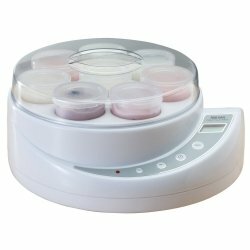 When you use an electric yogurt maker, all you have to worry about is mixing the milk with the bacterial culture, pouring it into containers that come with the yogurt maker, turning on the unit, and letting the yogurt maker do its job! Even though there are other traditional and non-electric ways to make yogurt, they take a lot of time to master until good results are obtained, and they could get messy as well as tricky in terms of satisfying the temperature requirements of the yogurt making process. The fastest and easiest way to produce with consistency delicious yogurt, without the preservatives and other additives, is by using an electric yogurt maker. Note that the taste of the yogurt produced will depend on various factors such as the types of milk and bacterial culture used, the amount of time that the yogurt is left to set, and the choice of flavoring added, if any. ​Have you not found yet the Yogurt Maker you are looking for?